Fly Fishing the rivers and lakes of Argentina and Chile is an experience that a fisherman never forgets. The knowledgeable guides, the comfortable lodges and the big Atlantic salmon, brown and rainbow trout that rise quickly to your fly (see Fishing Reports). Visit a Patagonia captured by the snow capped Andes Mountains with gauchos still riding the frontier. Not only will you experience the fly fishing of this region, but you will travel through a history of a people, shaped by the beauty of the life and the land that surrounds them. The Patagonia region of Chile and Argentina will always stay with you. The sounds of the rivers and the splash of the trout will always beckon you back. Let Patagonia Adventures be your guide to this enchanted land of tall mountains, lush forests and great Atlantic salmon and trophy size trout. With three lodges located in the heart of the Andes Mountains of Chile and Argentina, our knowledgeable guides will take you to the trout. With their knowledge of entomology, fly patterns and fly fishing, our outfitters will provide you with unforgettable experience. Catch & release of Atlantic Salmon, Brook, Brown, and Rainbow Trout. Ground transfers are included in fishing area and from/to local airport. Excellent accommodations in a lodge of your choice. Superb cuisine prepared fresh daily using local produce, game, and selected Argentina/Chile wines. Come to the land of great fishing! Contact Us Today! 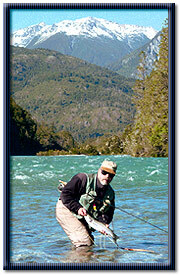 Our lodges and fly fishing for Atlantic salmon, rainbow and brown trout are rated the best in Chile and Argentina.